Star shower motion is your solution to no longer hanging mundane string lights all over your house for Christmas. An explosion of beautiful stars dancing on the face of your home is now just a click away. Simply place the extra-long stake in your front yard and in the matter of moments watch a brilliant shimmering of stars dancing over the house. It can be used to light up your house to show your loyalty to the country on the 4th of July or to add that little bit of spook at Halloween. The device is made by BulbHead and claims that image is projected using a weatherproof laser design. An inbuilt motion motor creates beautiful shimmering patterns of stars and shooting stars on the front of the house. The company claims that the decoration can be used to add sparkle to Christmas and Halloween decorations and also brighten up 4th of July celebrations. These stars can also be used indoors to make story telling time more fun and imaginative for kids. The cost of Star Shower Motion is $49.99 plus $9.99 shipping, for a total price of $59.98. The long stake is powered by a unique weatherproof laser design which projects the stars on the desired surface. No matter how cold or hot it might be, the star shower motion works in all conditions. The stake comes with a built in light sensor which switches on the display of shimmering showers when the surroundings get dark and switches off when the sun comes out. It consumes ninety nine percent lesser electricity than traditional hanging lights. This efficient and power saving device can be used unlimited. Hanging traditional lights all over the house means a nightmare of untangling wires and cleaning up glass from broken bulbs. With the Star Shower Motion, no more hassles of worrying about wires and bulbs, one simple device is all it takes to light up your house. The product can cover a whopping three thousand two hundred square feet of your home from a distance of a mere 100 yards. One device for your entire house which means no hassle of finding a hundred different lights to decorate the entire place. Unlike traditional lights used to decorate homes this product does not require any substantial time in setting up. Simply place the stake at a distance, switch it on and watch the magic come alive. It does not require any ladders to set up, no time wasted hanging and taking down lights and no fights between family about whose job it is to take down the decorations! The size of the laser light is small enough that it can easily be carried from one place to another unlike traditional lights which tangle up and create a mess when being transported. It has been tested and passed by Good Housekeeping, a quality check in the US since 1909. It comes with two additional holders- indoor base and lawn stake. The lawn stake makes it feasible to use suspend the laser light outdoors while the indoor base lets you stand the light inside the house sans the hassle. Star Shower Motion is your one stop shop for all decorations. Whether itâ€™s a sparkly Christmas, a spooky Halloween or a patriotic fourth of July this product will meet all your needs. It can also be used to brighten and lighten up your parties. The colors and shimmering motions of the stars can be used to bring alive a 70s themed disco party right inside your house. No need of buying a plethora of different lights to set the mood, just one stake is all it takes. Star Shower Motion can be used in a variety of other ways such as indoors to brighten up bedtime stories for children. The shimmering, dancing stars can be used as a backdrop to a fascinating story which would help stimulate the mind of young child. The product uses a unique weatherproof laser design which projects a holographic image of stars and shooting stars on the surface. An inbuilt motion motor is responsible for the shimmering moving designs created by the Star Shower Motion. Once the item is placed in the front yard or indoors, a simple button switches it on and another one begins the motion motor, if desired. The product has an inbuilt light sensor which senses the time of day and automatically switches on or off depending on whether itâ€™s day or night. Since the laser technology is weatherproof it can be used in extreme cold conditions during winter to brighten up Christmas decorations. The product can be placed either indoor or outdoor. If it is being placed outdoor, it can be attached to the extra - long stake. For placing it indoors, it can be attached to the indoor base. Operating the Star Shower Motion is very easy. The product switches on with the press of a single button and after that the light sensors switch it on and off as required. If desired, the rotator can be switched on to create moving, shimmering patterns of stars with the click of a button. Taking down the decoration is as simple as putting it up. Simply remove the stake from the yard or the base from the indoor setting and pack it away until the next occasion. Unlike traditional hanging lights, taking down the decorations is not a tedious and time consuming task. 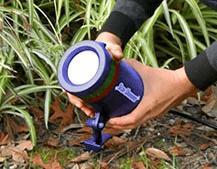 Star Shower Motion is a convenient, portable and easy to setup. Unlike traditionally used Christmas and Halloween decorations, it is not tedious, time consuming or difficult to install and dismantle. This feature means more time spent celebrating and less time spent dreading the setup. The product is also highly energy efficient and consumes ninety-nine percent lesser electricity as compared to traditional lighting. Its features such as automatic light sensing means that you install it once and forget about it for the rest of the holidays. Also being made of a weatherproof laser technology, the product can be used in the extreme weather of Christmas winters without having to worry about anything. The stars burst to life and can be used both indoors and outdoors to brighten up the neighborhood or brighten up a party. .